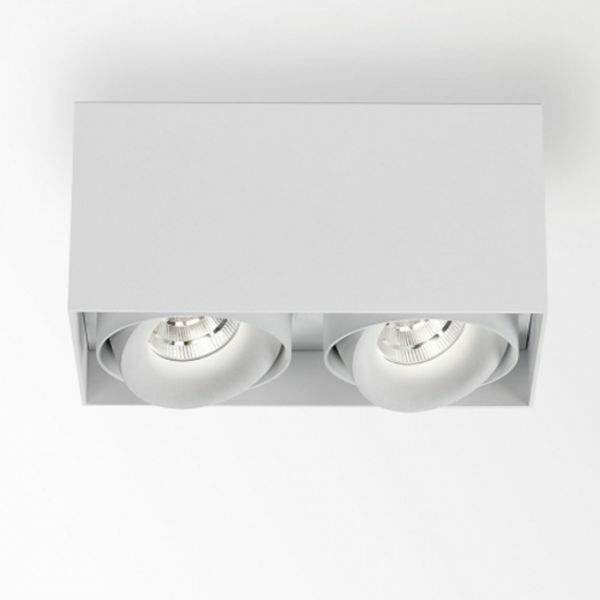 Product information "Minigrid on 2 box dimmable ceiling light"
The Minigrid on 2 Box is equipped with two spots inside, which have a wide beam angle and can illuminate large areas. Both radiators can be swiveled independently from 0 ° to 20 ° and can be rotated by 360 ° so that the light can be directed to the desired location without any problems. The Belgian manufacturer Deltalight installed high-quality LED lamps for the Minigrid ceiling light. They impress with their excellent energy efficiency and long service life. Thanks to the very good color rendering value, illuminated objects can be applied to the color. The innovative LED technology is the hallmark of the functional Minigrid product family. Various color combinations are offered for boxes, housings and spotlights so that a wide range of individualization is possible and the right model can be found for every device. The simple and elegant design makes the Minigrid an enrichment for any interior. The straightforward appearance places highlights on the illuminated objects and takes back itself. Dimensions in inch (WxHxD): 8" x 4" x 2,6"
Related links to "Minigrid on 2 box dimmable ceiling light"